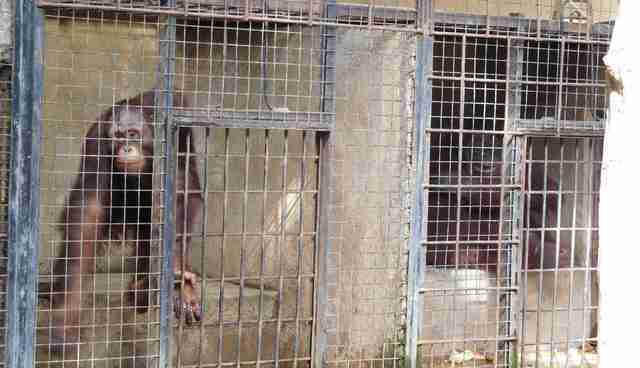 A series of photographs sent to The Dodo shows orangutans housed in deplorable conditions at an Indonesian zoo. "In over 20 years of seeing captive animals in Indonesia, this is the worst cruelty to captive orangutans I have ever seen," Sean Whyte, the founder of Nature Alert, a U.K.-based animal welfare organization, told The Dodo. According to Whyte, the orangutans are currently on public display at the Mirah Fantasia recreation park in Banyuwangi. (The Dodo could not independently verify that the photos were taken there.) Whyte says the orangutans were recently transferred to Mirah from the Surabaya Zoo, which has been referred to as the "zoo of death." The Dodo has previously exposed the cruel harnessing of elephants at Surabaya. Marison Guciano, senior investigator with the Indonesian Friends of the Animals, told The Dodo he took photographs and video of the orangutans in July. The orangutans didn't have water or appropriate sustenance, they were unable to socialize and they were confined to their barren cages day and night, Whyte says. Their ages and origins are unknown, which is common, due to poor record-keeping and alleged inbreeding, he adds. 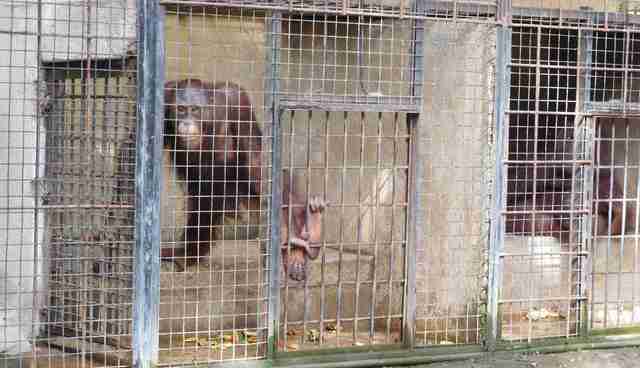 Guciano returned to the zoo again in late August, but saw only two of the orangutans still on display. It is unclear what has happened to the others. 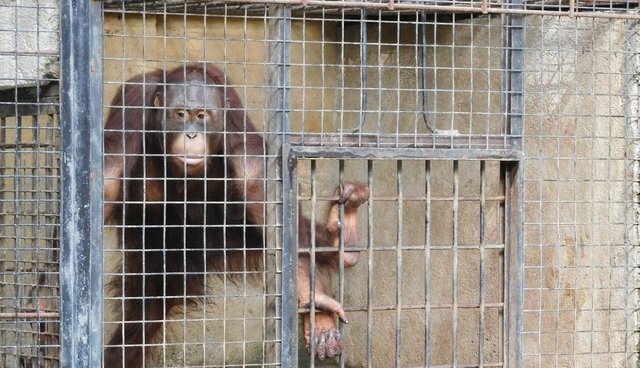 "Indonesian Friends of the Animals and its associate U.K. organization, Nature Alert, are desperately worried for these orangutans and government intervention to stop the cruelty and move them away from this zoo is urgently needed," says a joint press release from the two organizations. Gunung Gea, the founding director of the SCORPION Wildlife Trade Monitoring Programme, told The Dodo he was "very upset to know how Mirah Fantasi[a] handles the orangutans on its site. It seems that Mirah Fantasi management simply exploit orangutans to make money but do not pay attention to the quality of life of orangutans - the species which has 97 percent similarity with human DNA." Gea was previously the deputy director of the Sumatran Orangutan Conservation Program, which aims to protect the remaining wild Sumatran orangutans in the region. While many groups believe the orangutans at the Mirah are not receiving proper care or treatment, a representative from the Mirah Hotel in Banyuwangi, with which the Mirah Fantasia is associated, says otherwise. "I do believe that these animals are being held in appropriate conditions," Ketut Suadika, director of the Mirah Hotel, told The Dodo. "And we are working to provide proper and better housing for them." Suadika says a new orangutan housing facility is being built. 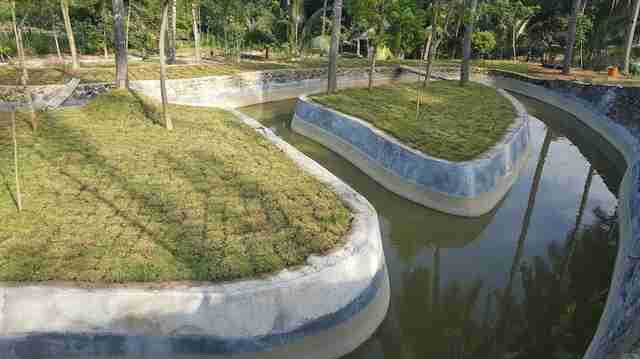 The animals will eventually be in a 7-acre animal camp with a private island surrounded by water, which will be finished by December 2015. The animals will also have a 13x13-foot house. 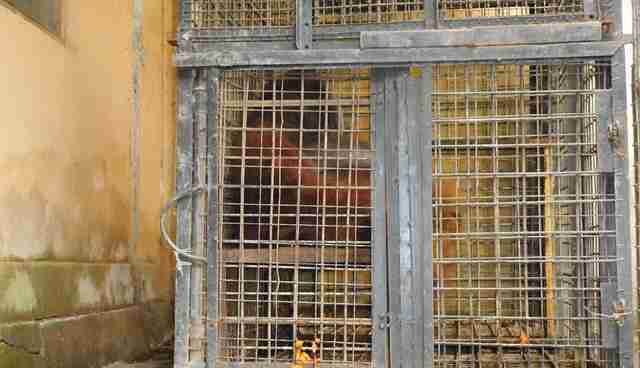 "We really love the animal and we fully sorry for the moment our condition is not properly yet," Suadika adds. Mirah Fantasia says this is the proposed site for the orangutan buildings. Whyte, meanwhile, says the authorities in Indonesia care little for the wildlife, and the orangutans' only chance of survival is public outrage. "They will die there in their tiny cages and no one will even care or miss them, because that's how it's been in Indonesia for at least 25 years," he says. For more information on efforts to improve the welfare of animals in Indonesia, visit The Jakarta Animal Aid Network.